What Sales Model Is Right For Your Startup? You’ve gone through Customer Discovery and validation. You have a handful of early paying customers. Those early customers were probably sold by you (the founder) or your first sales person. You have validated your minimum viable product. It’s time to grow. What sales model is right for your company? In my time at ATDC, scaling sales is probably the topic I spent the most time on with our ATDC Select companies. Figuring this out (along with your sales process and lead generation which I’ll cover in another blog) is one of the key criteria that determines whether a company is ready for graduation from ATDC. A scalable sales model is the key that drives your growth. A startup’s sales model is primarily determined by two factors: pricing model and product complexity. Your pricing model is how your products are priced – how much it costs, the basis for the cost, and how the customer is billed. For example, enterprise software might cost $x upfront, with an annual maintenance fee. A SaaS product might cost $y per month. How much you charge is determined by a range of factors including your costs, uniqueness, and the pain your product solves for the customer. Product complexity includes the depth of features, ease of use, ongoing service, and difficulty of implementation. For example, enterprise software is often more complex than a mobile app. Products that the customer is able to find, determine if it meets their needs, and purchase on their own are self procured. When you want to add a song to your iTunes library, you are able to search for the song, purchase it online, and download it from the iTunes store. When you purchase a product at the store you pick it up off the shelf and pay for it at the counter. Inside sales is when the sale is completed with the sales person and customer interacting remotely. Driven by technology, inside sales models are being used more frequently in B2B and some higher end B2C transactions. For example, when selecting a hosting provider for your web application you might contact several hosting providers to determine which one best meets your needs at the best price point and be given access to the servers remotely. Field sales, or outside sales, are ‘face to face’ customer sales. For higher priced, more complex products, cases where there are numerous stakeholders involved in the purchasing decision, consultative sales, or products that need in person demonstrations – visits with the customer are necessary to seal the deal. Enterprise software that will be used by multiple departments is one example that might require field sales. Some complex field sales models also require sales engineers, which are product experts capable of performing detailed analysis to determine fit, configuration, and pricing. Some companies employ multiple sales models. For example, Salesforce.com uses all of these. A small company with simple CRM needs can self signup for the cloud service online. An inside sales rep may also interact with the company remotely, qualify the customer, address their questions and concerns, and sign up the customer. Larger, more customized enterprise implementations are sold using field sales professionals and sales engineers. 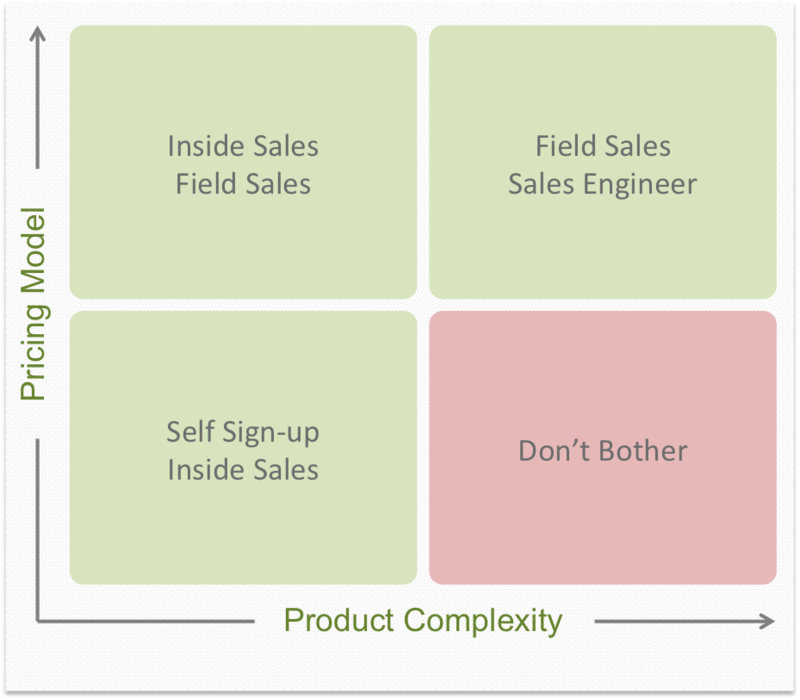 So which sales model is right for your product? Lower priced products require less expensive sales processes – and more complex products require more customer interaction. Complex products sold at low prices are usually a recipe for unprofitability. The chart below illustrates how your pricing model and product complexity determine which model fits your company. The best entrepreneurs know that when starting a company there is no substitute for help from experienced mentors that have ‘been there, done that’. At ATDC, we are fortunate to have a pool of over 50 volunteer mentors ready to bring their years of functional and industry experience and deep networks to help our companies succeed. I couldn’t be more grateful for the tireless effort of our mentors. In addition to working one-on-one with our companies, we often ask them to help with our educational series workshops. They are extremely accessible – all of our companies can schedule time with mentors online. The mentor program is one of the cornerstones of ATDCs programs so I meet with potential mentors on a weekly basis. Finding them is not the hard part – Atlanta has a great ‘pay it forward’ spirit and there is no shortage of volunteers. Matchmaking is another story. You can’t assign mentors. It’s a relationship. Sometimes born out of specific problems our entrepreneurs are trying to solve, and other times built around lasting trusted mentoring relationships. Some volunteer mentors understandably get frustrated that they aren’t utilized by the startups. After all, they are volunteering to help for free – why wouldn’t startups want to take advantage of that? The key to successful matchmaking is understanding the mentors’ interests and expertise. Most mentors volunteer for all the right reasons – giving back to the community, staying involved in innovative emerging technologies, and expanding their own networks. While we love it when a mentor joins or funds one of our companies, we work hard to screen out mentors who are looking to find consulting gigs with our startups. Identifying the issues and saying “pay me to fix it” is not mentoring. By nature entrepreneurs are extremely resourceful. They are also busy as heck. Our education series covers the basics. They are looking for mentors that can really change the trajectory of their success. Matching them with experts willing to dig in is one of the best ways we can help them succeed. Mentors volunteering to give feedback on pitches and general business strategy are common and Atlanta has an abundance of programs for that kind of help. Mentors willing and able to roll up their sleeves and help the entrepreneur with specialized needs – helping with customer discovery, figuring out their target customer, building scalable distribution and sales, building financial models, developing supply chain strategies, providing industry expertise, and providing introductions to customers, partners, and investors – are in shorter supply and higher demand. If you have deep startup, functional, or industry expertise and want to help an entrepreneur change the world, we’d love to have you as part of our mentor program at ATDC! Or volunteer with VentureLabs, FlashPoint, GRA, ATV, Startup Chicks, Hypepotamus, or any of the organizations that have mentor programs. And when you do, focus on getting matched with startups that can leverage what you are truly, uniquely an expert in. If you are already a mentor and want to have more opportunities to be matched with startups, don’t use your standard bio, create a profile that lets entrepreneurs know what areas you are a top 2%er.